At the beginning of last month, my brother visited us for a week. He has been living in northwest UK for the last year, and he will be there until the end of 2019, when he plans to move back to the US. It has been tough to have him so far away, with our conversations limited to Skype calls, and only a few visits during the year. We are really looking forward to his return home! But in the meantime, he is in the land of sheep, after all, so I am hoping to pay him a visit this summer and enjoy the beautiful countryside around the Lake District and southwest Scotland. I’m sure we can visit a few yarn shops on the way! Whenever my brother returns home for a few days, he is well aware that a pile of sweaters will be awaiting him. 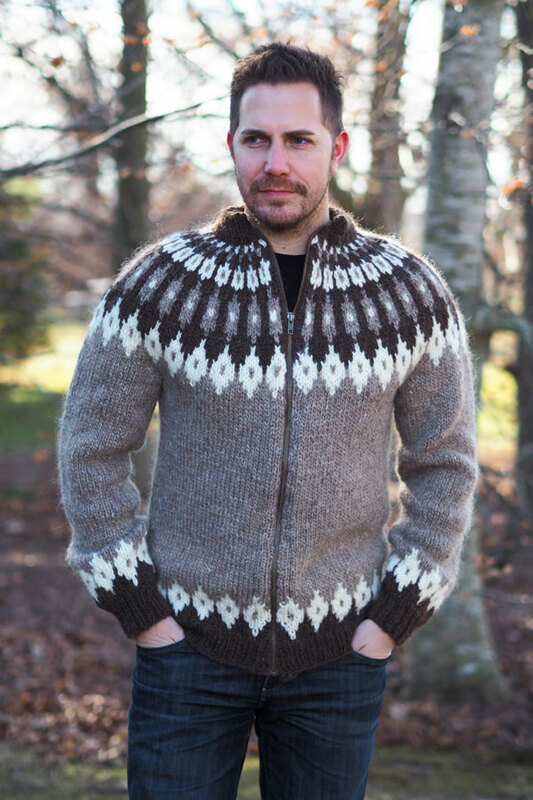 He has been my sweater model for my Icelandic Lopi sweaters for a number of years now. 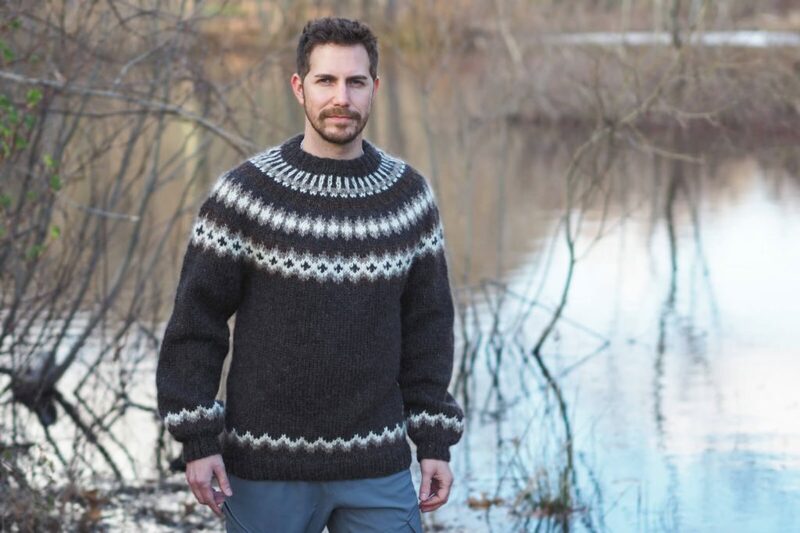 We have it down to a science: I know just what size to knit, we know the best spots for photographing them, he throws one on, stands around looking pleasantly scruffy and Viking-like, and I click away with the camera. When all goes well, we can knock out a photo shoot in a matter of minutes. 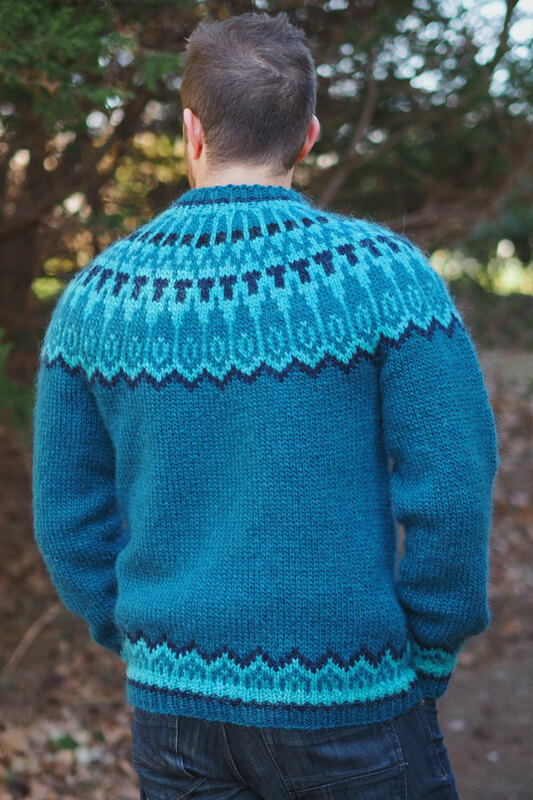 Turf and Clouds Icelandic Pullover. This time, I had three sweaters knitted, blocked, and ready to go when he stepped off the plane. The poor guy barely had time to wipe the jet lag out of his eyes before he was out there in frigid January temperatures, modelling sweaters in an icy ocean wind. 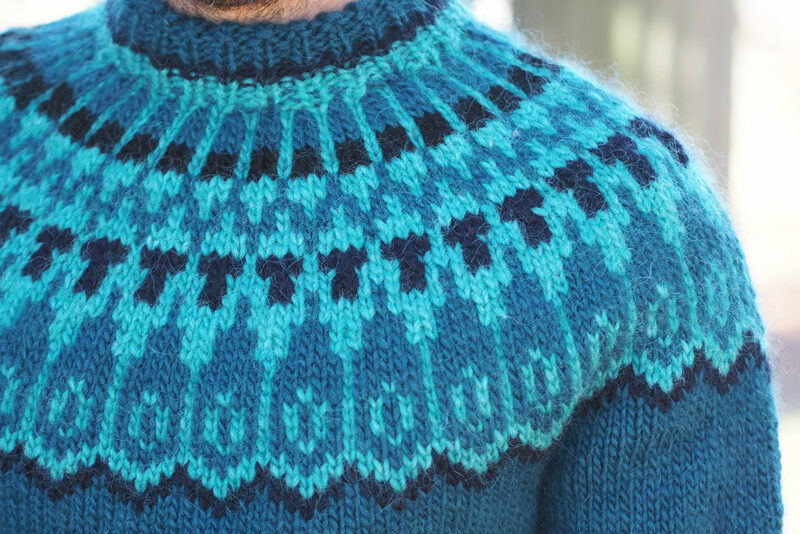 One of the sweaters I cannot show at the moment, because it is currently under contract for publication. More on that one at a later date! But I did want to show the two Lopi sweaters he so kindly modelled for me. 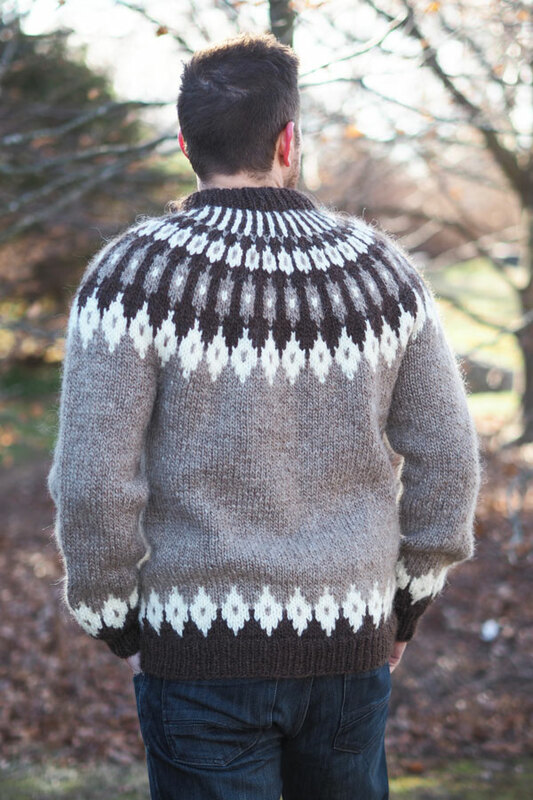 The first I made over the summer of 2018, sweating away at the indoor pool during my son’s swim lessons with a heavy Icelandic sweater draped over my legs. 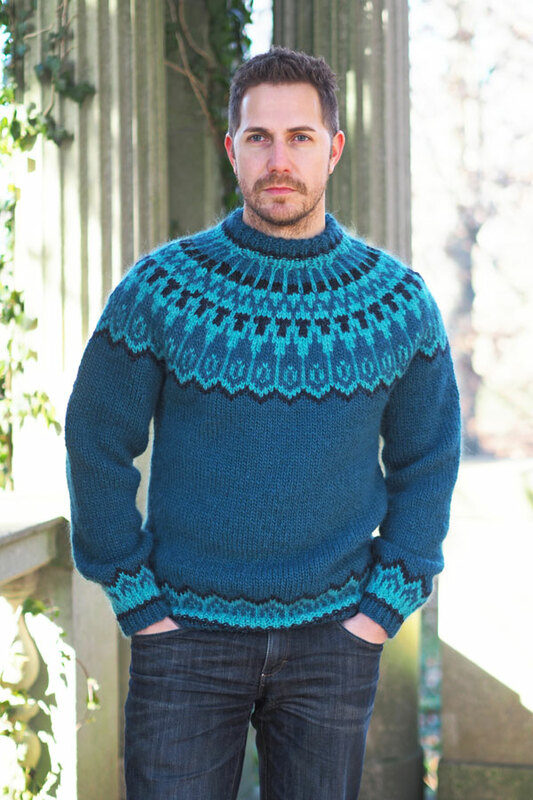 This sweater features bold teal and aqua colors along with a deep navy. Teal and aqua Lopi sweater. I wasn’t sure how I would feel about this color combination, but I think it turned out really nicely. The colors remind me of the north sea on a crystal clear day. Teal and aqua Lopi sweater, back. Teal and aqua Lopi sweater, yoke detail. 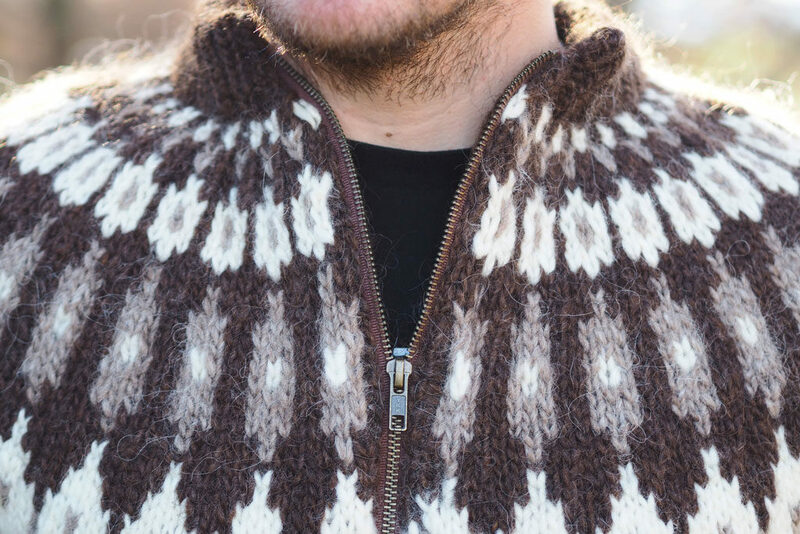 The second Lopi sweater was a much more traditional pattern and colorway. I decided to go through the trouble of making it a zip front. This requires quite a bit more labor, plus the expense of a good quality zipper, but I think it’s well worth it when the finished product turns out well. I personally love zip-front sweaters, especially in Lopi, since they are warm enough to function as an outer layer. I’ll be posting in the upcoming weeks a tutorial on how to add a zipper to your sweater and how to give it a professional finish. Taupe and brown Lopi zip-up sweater. Can you tell my poor brother was suffering from the cold at this point? I think I had to edit out his bright red nose! Living in the temperate UK can make one soft, I suppose. Taupe and brown Lopi sweater, back. I like the neutral shades in this sweater. They are super traditional (here dyed, but could be made with undyed wool) and they remind me of tree bark in winter. Taupe and brown Lopi sweater, yoke and zipper detail. All in all, it was a successful photo shoot and a wonderful, if short, visit with my brother. I’m looking forward to seeing him again soon, in the land of sheep and rolling hills!